De nieuwe iPad Pro (2018) is langs verschillende internationale redacties geweest. Dit is een overzicht van de recensies en bevindingen. Vanaf 7 november zijn de nieuwe Pro-modellen ook in Nederland te koop. De nieuwe iPad Pro (2018) in de varianten 11- en 12.9-inch zijn vanaf 7 november beschikbaar in Nederland. Verschillende leden van de internationale pers hebben de tablets al in handen gehad en hebben inmiddels hun bevindingen gedeeld met het grote publiek. De nieuwe Pro-modellen beschikken over een groter scherm, dunnere randen en een Face ID-camera. Door die dunnere randen is er geen ruimte voor een thuisknop met ingebouwde vingerafdrukscanner. Daarnaast werken de tablets met de Apple Pencil 2. Wil je nu alvast een snel overzicht waarin de verschillen tussen de nieuwe en oude iPad Pro’s worden besproken? Klik dan hier. Ook is het alvast goed om te weten dat de oude Apple Pencil niet werkt met de nieuwe modellen. Hieronder behandelen we de recensies die tot op heden zijn verschenen op verschillende websites. Apple says this is the iPad it’s wanted to build all along, and I’m not surprised. All the horsepower tucked away inside (and there’s a lot of it) is more accessible because of this streamlined design, and I don’t think I could go back to an iPad that wasn’t this trim. En laat Techcrunch het volgende weten. The overall aesthetic is much more businesslike and less ‘friendly’ in that very curvy sort of Apple way. I like it, a lot. The flat edges are pretty clearly done that way to let Apple use more of the interior space without having to cede a few millimeters all the way around the edge to unusable space. In every curved iPad, there’s a bit of space all the way around that is pretty much air. Cutting off the chin and forehead of the iPad Pro did a lot to balance the design out and make it more holdable. Daarnaast wordt er bijvoorbeeld ook gesproken over het zogenaamde Liquid Retina-display. The Verge merkt op dat het grotendeels het scherm van vorig jaar is, maar dat het nog steeds het beste display is om naar te kijken. Apple keeps saying the iPad Pro now has an “all screen design” that “goes from edge to edge,” but let’s just be honest: nothing about these bezels is edge-to-edge. It is, however, an extremely nice 264ppi LCD screen, and I continue to be a fan of Apple’s fancy technique to round off the corners of LCDs. 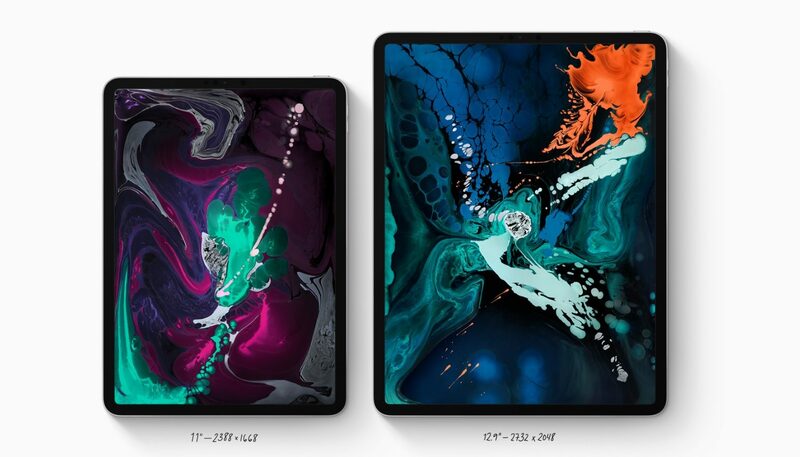 Apart from the corners, the new iPad Pro display is substantially the same as last year’s Pro, with Apple’s extremely smooth 120Hz ProMotion variable refresh rate system, True Tone automatic color calibration, and wide color support. This is one of the best, most accurate mobile displays you can look at. Ook iMore is zeer te spreken over het scherm. Apple’s doing all the color management and individual color calibration you expect here, so iPad Pro looks dead accurate — so much so that, like iPhone XR, it can be hard to tell Apple LCD from Apple OLED in anything but the deep blacks and the off-axis. And yeah, that’s still impressive. Face ID gebruiken gaat echter niet zonder slag of stoot, zoals Wired heeft verwoord. Zo kan het gebeuren dat je de lens van de camera blokkeert wanneer je de iPad Pro (2018) ‘verkeerd’ vasthoudt. It works well, and doesn’t require that cut-out notch on the screen like the iPhone. It’s not quirk-free, though. We usually hold our iPhones in a portrait (vertical) orientation because that’s just how they fit in our hand. With an iPadlike this, you almost always use two hands, and that means there isn’t really a “right” or “wrong” way to hold it. From time to time, my hands would sometimes accidentally block the Face ID camera when I held it in landscape (widescreen) orientation. And if I’m lounging around, my face may also be out of view. As I’ve gotten used to keeping my head in front of the tablet screen, and my hands away from its front-facing camera, Face ID evolved from a hindrance to a helpful, secure aid. Dit is de eerste iPad zonder Lightning-poort. In plaats daarvan leunt Apple nu op usb-c. Is dat een verbetering? Over het algemeen wel, maar niet alles werkt, laat The Verge weten. I tried a handful of USB-C hubs with an assortment of USB-A, HDMI, card readers, and Ethernet ports, and everything worked as intended… other stuff didn’t work, though: printers didn’t do anything. A Native Instruments Maschine mk3 audio controller sat in silence. A Beyerdynamic USB-C microphone only worked when we used an A-to-C cable plugged into a hub. USB-C is still kind of messy and weird, so you’ll just have to try things and see what works for you. But one extremely important category of devices will definitely not work: iOS does not support external storage. You can plug as many flash drives or hard drives as you want into the iPad Pro’s USB-C port, and nothing will happen. Included in the box is a 18W USB-C charger that means you can charge much faster and if you’re a heavy user you’ll need it. Using USB-C means you can charge it with your MacBook charger and it also supports reverse charging – so you could use it to charge your iPhone if your battery is low. Mashable laat weten dat het wel snor zit wat de batterij betreft. Battery life is also as excellent as on previous iPads. Apple advertises “up to 10 hours” for mixed usage and I got just about exactly that for reading, playing some games, watchings lots of YouTube and Netflix, and typing out some of this review. More intensive apps like Rush CC and iMovie will drain your battery quicker, so keep that in mind. But even still, I still got around 7-8 hours while working with pro-level apps. It doesn’t feel like the world is ready to treat my iPad as an equal to a PC yet—even if that iPad is a lot more powerful and user friendly. Now that Apple has declared the iPad is a PC, it should take more of the guardrails off of iOS. Ook hebben de redacties zich nog uitgelaten over de Apple Pencil 2, de opvolger van de eerste Apple Pencil. Het opladen gaat dit keer anders, schrijft iMore. The new Apple Pencil has the same tip and core technology as the original but just about everything else has changed. There’s no cap on the back to lose anymore and no Lightning plug either. It charges inductively now by magnetically piggy-backing right onto the side of the iPad Pro. It uses a series of magnets carefully arranged with alternating poles to force precise alignment and, when it gets it, locks into place with a satisfying, AirPods style thunk. Techradar meldt dat de nieuwe Apple Pencil 2 toch wat problemen heeft. Zo loopt het koppelproces niet altijd vlekkeloos en kan de Pencil 2 losraken wanneer je hem uit je rugtas haalt. We had a few issues with the Pencil. The first is with synchronisation: when it clips on magnetically, it’s supposed to pair with the iPad Pro (which ours did) and then be ready to use when removed (which ours did not always do). It also came unclipped easily when the iPad Pro was taken out of a rucksack, with the Pencil slipping off into some dark recess rather often. There were multiple times when we’d remove it to no result – another connection was needed to get it to work, and we’d have to ‘tap to connect’. Not what you’d expect for something that costs $129. Voor meer informatie over de iPad Pro (2018) kun je terecht op de productpagina’s. Klik hier voor de pagina van de iPad Pro 11 en klik hier voor de iPad Pro 12.9.